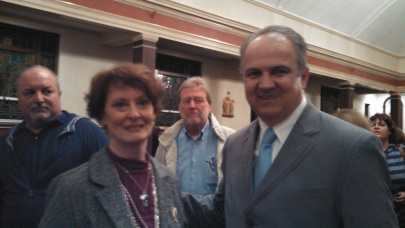 Alberta Sequeira, a four-time award winning author and Awareness Coach on Alcohol Abuse, of Rochester, Massachusetts, went to the event “A Night With Our Lady of Medjugorje and Ivan Dragicevic” at the St. Nicholas of Myra Catholic Church on Spring Street in North Dighton, Massachusetts. Sequeira had been a former North Dighton resident for over thirty years, living on School Street as a teenager, and she married Richard Lopes of North Dighton, and they lived on Old Somerset Avenue with their daughters, Debbie and Lori. Alberta presented Ivan and his interpreter, Ann, an autographed book of her memoir A Spiritual Renewal: A Journey to Medjugorje. In 1998, she had received a calling from Our Lady to travel on a ten day pilgrimage to Medjugorje, a tiny, remote village in Bosnia. She met four visionaries out of the six and witnessed two having their daily apparitions with Our Lady, and Ivan was one of them, who she followed during the week. Ms. Sequeira has gone to three events to see Ivan in Fall River, New Bedford and Medway, Massachusetts to see him during his apparitions. No matter where Ivan is in the world, at exactly 6:40 p.m., Our Lady appears to him. The Blessed Mother has been appearing to the six visionaries since 1981, and She has one more secret out of ten to give to two visionaries before they will be revealed to the world. It was the first event that Alberta had seen Ivan stay and greet every person until the last one left church. Usually, they rush him out after his talk. He and his interpreter, Ann, were very personable. Ivan talked about how Our Lady moved and looks during his apparitions. He said that She touches him. Ivan explained how many times, it takes him hours to adjugst coming back to earth after his apparitions with The Blessed Mother. Alberta feels that her greatest gift being in the presence of Ivan with his apparitions is absorbing the mystical act that Our Lady actually comes down from Heaven, and she is in the same location The Blessed Mother is occupying. Mary blesses each one and their families who goes to the events with Ivan. On April 10, Alberta went to the St. Nicholas of Myra Church hall to see the introduction of a video on Medjugoje for those who had no idea what Medjugorje, the visionaries or the secrets are all about in Bosnia. The event had been opened to the public. Ms. Sequeira presented a talk about her trip to Medjugorje and her spiritual change and why she wrote her book. She also book signed A Spiritual Renewal; A Journey to Medjugorje. Ms. Sequeira is available to do a speaking engagement and book sign at your church or any event. Her topics can range from her trip to Medjugorje, A Spiritual Change Within or The Effect of Alcoholism on the Whole Family, after she had lost her husband, Richard Lopes, and her daughter, Lori (Lopes) Cahill of North Dighton to their alcohol addiction. 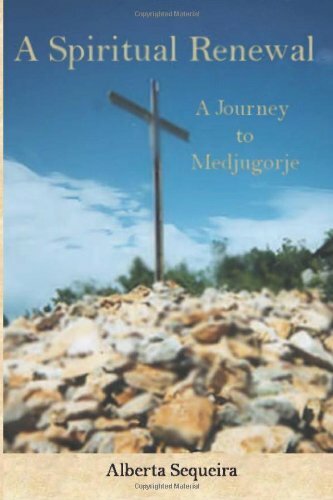 A Spiritual Renewal: A Journey to Medjugorje is available at: http://www.amazon.com/Spiritual-Renewal-Journey-Medjugorje/dp/1937588122/ref=sr_1_3_title_1_pap?s=books&ie=UTF8&qid=1402684066&sr=1-3&keywords=Alberta+sequeirain paperback and Kindle. Alberta can be contacted for a quote on an event at her email alberta.sequeira@gmail.com.